We got up at 5 am this morning so we could be on the road by 7 am. Our plan was always that I would go with Leo, and one or two of the older children. But then Gregory really wanted to go, and Mary Evelyn sounded interested and Linda was dropping hints that she would kind of like to go too. The deciding factor was when Denise reported that she had confirmed with the orphanage director “and she say you bring your whole big family with you, okay?” While we were having lunch today the Director Chen told us that when she told the nannies that we would be visiting, they all begged for her to tell us to bring the whole family because they really wanted to see all of his siblings. So we got in the big van and headed out of town. Leo slept the first two hours, but he was increasingly apprehensive and scared after that. I’m sure he was thinking of the long van ride that brought him to us and wondering where this ride would end. The older two both played on their DS and the younger two listened to audiobooks and we all watched the Chinese countryside roll by. It looks a lot like any American countryside. There are a lot of rivers in the area. Denise told us that this town is a lobster town and that town cultures pearls in the river. 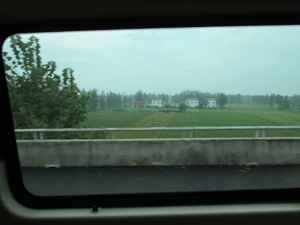 We passed over one waterway that Denise said brought water from the Yangtze to Beijing. Matt was surprised that such a huge city could be in an area without a natural water source and asked Denise how that came to be. She said that Beijing was attractive to the emperor who moved the capital because of the Great Wall, so it had natural defenses, and also because of the people in the area. She said there is a minority group there who are not Han Chinese who are known for being industrious and energetic, and so it was though that they would be good administrators. 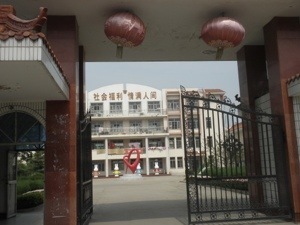 Four hours later, we arrived in Lianyungang. Lianyungang is a coastal city, right across the bay from South Korea. Denise said that it is a vacation city, because people travel to see the famous Monkey King Mountain and visit the beach. It is also common to travel from there to vacation in South Korea, but that requires an $8000 deposit at the police station to make sure you return! We arrived at the orphanage and were given a very warm welcome. The nannies were just leaving for lunch and they all swarmed Leo, smiling, laughing, and take pictures of him and us. It was wonderful to see how excited they were to see him, and how happy he was to see them. It shows that he had a good bond with them. I met the woman who was his primary nanny until he was moved to foster care, the “grandmother” he was assigned through the Half the Sky program, and a woman who was introduced as his “recovery” nanny. I’m not sure what that was, but I got the impression she worked with him on activities to help him meet his developmental milestones. 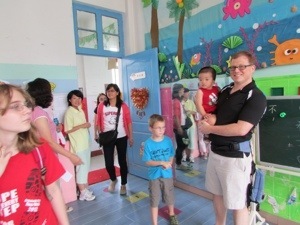 After the nannies left, we took a small tour of the orphanage. We were only shown the areas where Leo had been. We visited the baby room where the older babies were all getting ready for naps. Many of them sleep two to a crib because space is short. This set of buildings is about 20 years old, but they are going to be moving to a new facility before the end of the year. We were able to see the plans, but it was frankly very sad to see that they needed so much space. The director asked if we were planning to adopt again and tried to entice us with a very adorable little girl, saying she could tell we were short of girls. I made sure to move Matt along before he could get too attached. We saw the room where the toddlers play, as well as a sort of preschool that they had downstairs. I noticed they had bookcases in the hallway where children placed their shoes and they had put the child’s picture in each place so they know where their shoes go. Although the building is older, it was bright and cheerful. Just like a school, they had children’s artwork hanging everywhere in the classroom areas. In the stairwells they had pictures of children who had been adopted out of the orphanage. After the tour we went to the staff lunchroom to eat. The other blogs I had read where people visited the orphanage usually had the family eating out at a restaurant with the director. I wondered if that was too expensive because of our group size, but I didn’t have any regrets. We were served a mountain of food, and the director told us that some of the dishes were the same as the children were served for lunch that day. I loved that I was eating fish stew made from locally caught fish, and it was the same that the children ate. How wonderful that they get fresh cooked food every day. I guess I had thought they were getting the sort of factory made frozen foods that they serve in schools here in America! The director told me at lunch that about 100 babies are abandoned in the area each year and come into their care, but only about 30 are adopted out, most internationally. I have heard many adoptive parents say that when children in China “age out” meaning they can no longer be adopted at age 14, they are then turned out into the street. I read on the Love Without Boundaries website that they actually remain in care until age 18. Director Chen told me that the kids receive some education at the orphanage and those who are able to work, they try and train for some job. She said they try to help them get a job in town, or maybe they can work cleaning at the orphanage. For those who are disabled to the extent that they can’t work, the state will continue to care for them, and they will be moved to the home for the aged which is located in the same facility. After we finished lunch we said goodbye to the director. She said we must come back to visit when Leo was older, maybe ten years from now. She said that would give us enough time to save up enough money to bring the rest of the family to visit with him! Then she said that she would be retired by that time, but not to worry because her apartment is very close to the orphanage so she can still come by when we visit to see us all again. She was such a great person, you can tell she really has a heart for the children. For such a long drive, we really weren’t there very long. We were able to stop by Leo’s finding place on the way out and take a picture for him. Leo napped the first two hours home again. When he woke up he actually seemed much happier than before. I guess he decided he wanted to stay with us, because he wasn’t at all upset that we didn’t leave him at the orphanage. However, he has decided that Matt is his favorite parent and now he doesn’t want to have anything to do with me. If Matt sets him down for an instant he will immediately start to cry. I’m not insulted because I know this is a normal behavior and it doesn’t last forever. We are exhausted from the long day, so we just had a quick supper at the hotel with food that we had packed. Now we’re getting ready for bed. I’m having a lot of trouble keeping an internet connection so I will upload the pictures tomorrow. 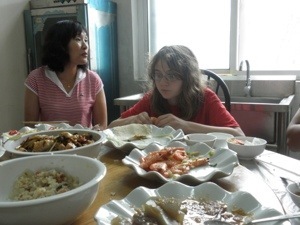 This entry was posted in Uncategorized and tagged China trip 2013, Leo, Orphanage visit on September 5, 2013 by minefam. This was so fascinating to read.